Home/ The Kitchen Pantry, San Lorenzo e Menu for Hope! The Kitchen Pantry is pleased to be part of Menu for hope 2007, the wonderful event launched by Pim, of Chez Pim. After last year huge success, raising more then 63.ooo US$, this year we are working to raise money for the UN World Food Program. In collaboration with San Lorenzo, and hosted by Fanny for Continental Europe and Johanna for UK, I invite you to buy the raffle tickets (minimum donation 10 US$) and add the code EU02 to win the hamper explained here! Then, tomorrow, I’ll give other reasons to buy raffle tickets! You can enjoy a nice risotto made with organic Carnaroli rice and astonishing dry porcini, bigger than ever… Please yourself and your friends with a dish of egg tagliatelle dressed with out special sauce for egg pasta, or a galore of organic penne rigate simply dressed with few drops of truffle oil or a spoonful of wild boar ragù… Have our little onions in balsamic vinegar for appetizer, with some anchovies on the side… And why not try the forest honey with some strong cheese? And then you can enjoy our outstanding peach jam with a nice slice of toasted bread… And don’t forget out incredible extra-virgin olive oil, made only with Italian olives… Remember to chill the Prosecco too! 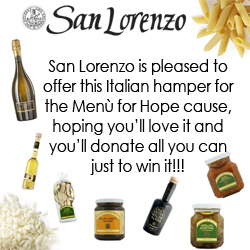 An Italian galore of outstanding and wonderful food, brought to you only by San Lorenzo, your favourite on-line store for Italian food, proud to be part of Menu for Hope 2007!